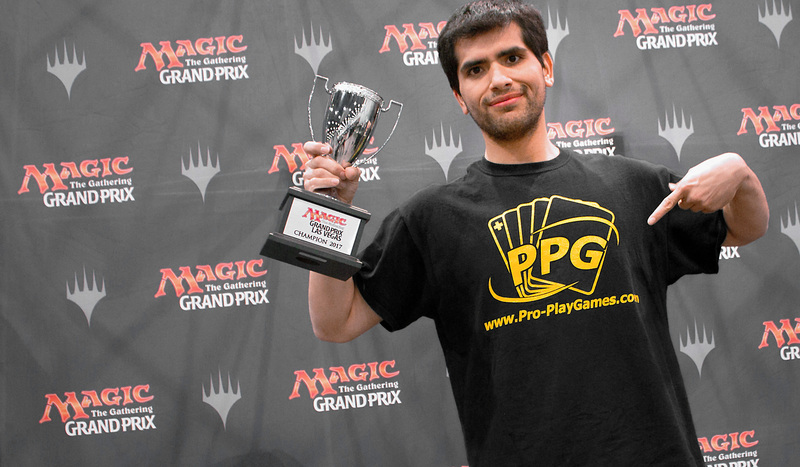 Miami Magic player Andrew Calderon put the pressure on one opponent after another to win the Grand Prix Las Vegas 2017 Legacy main event and the first of three trophies to be awarded this weekend! Follow all the action from the three main events taking place at Grand Prix Las Vegas! What started as 2,656 Legacy players ultimately came down to one, and it was Death and Taxes in the hands of Miami Magic player Andrew Calderon that ultimately came out on top to win the first of three trophies that will be awarded here in Las Vegas this weekend. Calderon had to battle through fourteen rounds across two days, becoming one of the fortunate four players who were able to secure their Top 8 berths with a draw in the fifteenth and final round of Swiss. From there, he faced a gauntlet of Delver decks, piloted by Patrick Tierney in the quarterfinals, Christopher Iaali in the semifinals, and Jonathan Semeyn in the finals. He fought through undeterred, making his first Grand Prix Top 8 an even more memorable one with a win, $10,000, and a trophy. Congratulations once against to Calderon for his hard-fought victory...and all the best to him in Saturday's Modern main event, as he goes for two! The historic, four-day-long Magiccelebration in Las Vegas has written its first chapter. The Legacy Grand Prix's first day has finished, and was filled to the brim with action from all of Magic's history. Though the format's standard standouts were in full display, decks like Goblins, Dragon Stompy, Atraxa Fit, and many more oddities came out of the woodwork to challenge the status quo. Out of 2,656 players, only ten have a perfect 9-0 record. Pro Tour Eldritch Moon winner (18) Lukas Blohon is joined by Nathan Smith, Sammy Tharmaratnam, Patrick Tierney, Zachary Koch, Jacob Haversat, Sam Roukas, Chris Iaali, Collin Rountree, and Mathew Chung to lead the pack into the second half of the Grand Prix. But that's not all the action happening tomorrow. In addition to the Legacy Grand Prix's conclusion, and the myriad side events and panels firing all the time, the weekend's second Grand Prix will be starting! We've only just begun here in Las Vegas. There are three more days of action, starting tomorrow with the exciting conclusion of the Legacy Grand Prix. Join us bright and early at twitch.tv/magic! See you then. The hashtag for Grand Prix Las Vegas is #GPVegas. Join the conversation!